Somewhat Quirky: Happy Birthday To Me Part Two! Happy Birthday To Me Part Two! I really wasn't planning on spending half of my birthday (Saturday) riding around looking for estate and garage sales. But I got this call...about a garage sale.....and after finding this little settee buried deep in the garage I was a gonner. I mean who wouldn't be? It is from one of the grand old hotels of Detroit. I've been wanting to find a settee for my dining room for at least seven years - and here it was. I don't even think I will reupholster it. I think I will clean it make a slip cover for it and then make a cushy six inch thick cushion for it. Oooooweee baby! And then we were driving down the street looking for a sale and look what we found.....this little chest with a big FREE sign on it. It looked like there was another car checking it out, but it was a Porche and there was no way they could pick it up. Besides that - we hopped right out of the car snatched it up and it was in the back of the Durango before I could say Happy Birthday to Me! It's going to be pretty dang cute all painted up! I don't usually buy froo-froo things but this candelabra was only $5. I though it might look cool on top of my china cabinet so I bought it. Now I regret it a little, because it is too tall and it's almost as big as my whole dining room. The other little candle is more my style and it was $1. We hit the last five minutes of a moving sale and I got this little chair for a song. I think it is another candidate for paint and probably fabric. I'm just a little bit in love with this mirror. The frame is metal, a little rusty, and the whole thing weighs like 50 pounds. And what about this little child's chalkboard? So cute. Not a clue how I will use it but that doesn't matter to me because it's so dang cute. Now that was a great way to spend your birthday. Happy Birthday too. Great finds indeed. You scored! Love that settee and the little French chair? Be still my heart. Sounds like your birthday was awesome. Is there any cake left? Bet not. 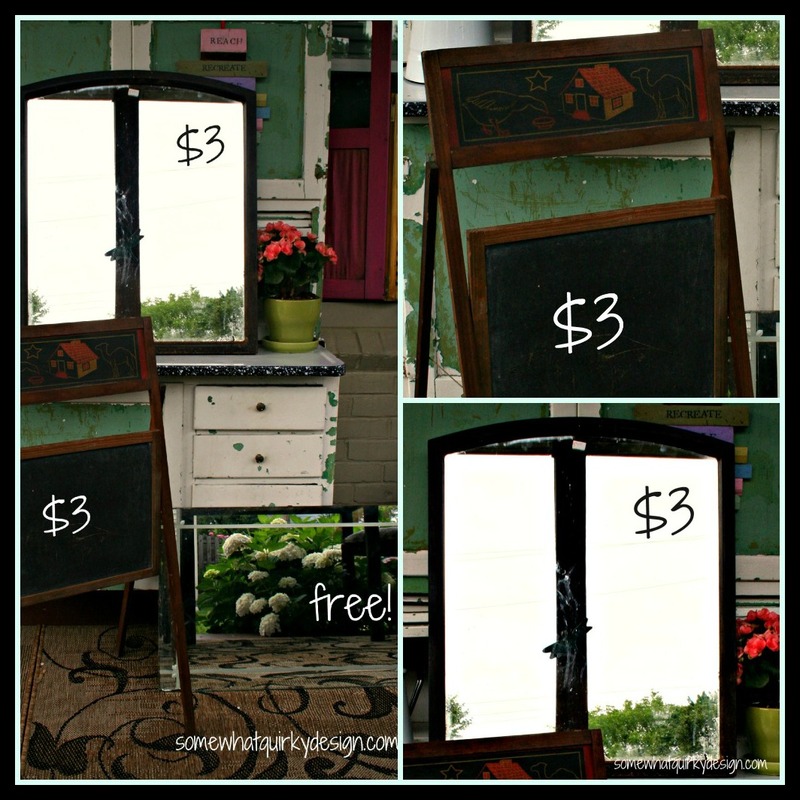 That little chalkboard would make a great sign out on your patio or something. What a bunch of treasure. I'm practically drooling. You'll have to show us how you fit these things in. I'd love to see what you do with them! Wow you got good stuff. I liked it all. I can't believe that chest was free. It looks to be in good shape. BTW - in case you haven't checked out my "karen" pinterest board lately, I pinned a metallic chest. What do you think? And I made that Trisha Yearwood key lime cake last week and it was very delicious. Make it soon. Someday you should do the "ones that got away" post. You should also off set your spending with the $$ you will get from redoing the 5 harp back chairs I got from the guy with the settee. Not to mention the left over from product I'll buy for you to redo them. p.s. Are you going to share your new cornbread recipe? The birthday gods were with you! That tree slice is amazing!!!!!!!!!!!!! If you change your mind, ship it to NJ. 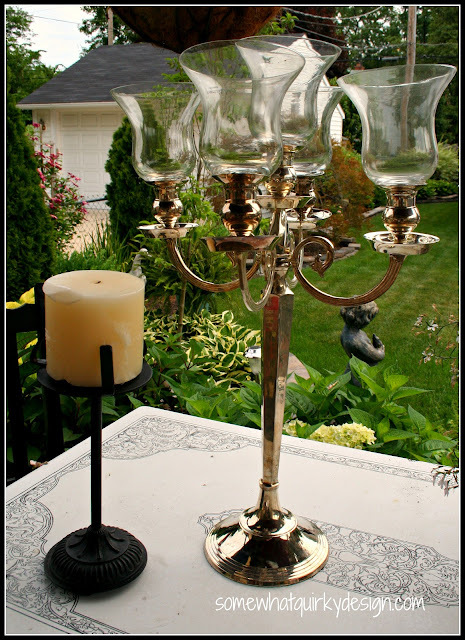 The candelabra could make a fabulous bird feeder if you get tired of it inside. I drove by the most fabulous desk today - but was all by my lonesome so could not lift it into my car. It's times like these, we need partners in crime (but since I have to hide my finds from the Hubs, I'm on my own). Cheers and Happy B-day Part 2 to you. Crazy good stuff! Happy birthday to you fer shure! PS. That candelabra thing has Halloween written all over it for me. What great birthday finds - love that chair and the chest of drawers AND the rediculously low prices ! OMG, girl you totally SCORED!!!!! What awesome birthday finds!! I used to live in Grosse Pointe Park. 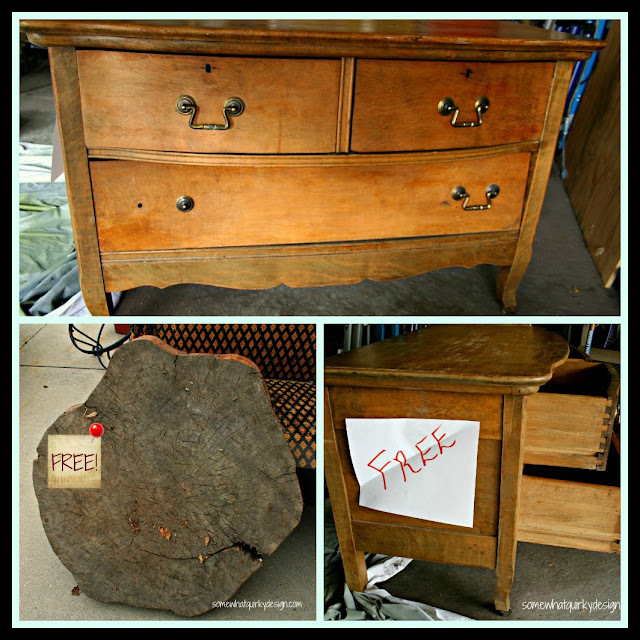 It indulged my love of estate and garage sales! I had the basement of my flat stuffed with goodies that I now use in my 1926 home in Howell. I miss all the great sales in the area! 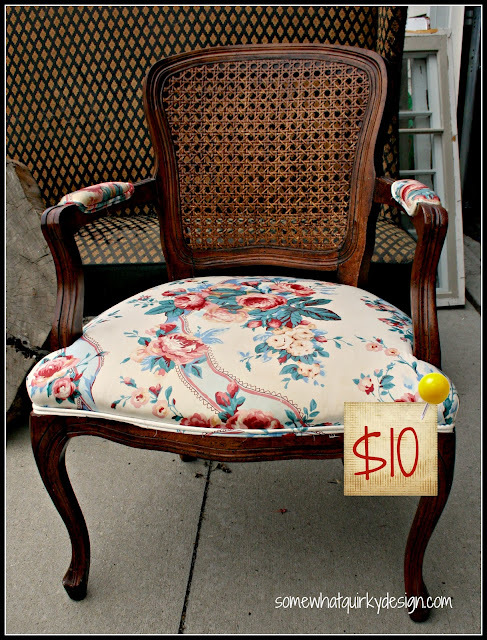 If you ever find that you are needing to get rid of stuff, you can always donate it to Enchanted Makeovers. They makeover women's shelters in cottage style. I will be helping on their makeover at the Detroit Rescue Mission. Wow is all I have to say! 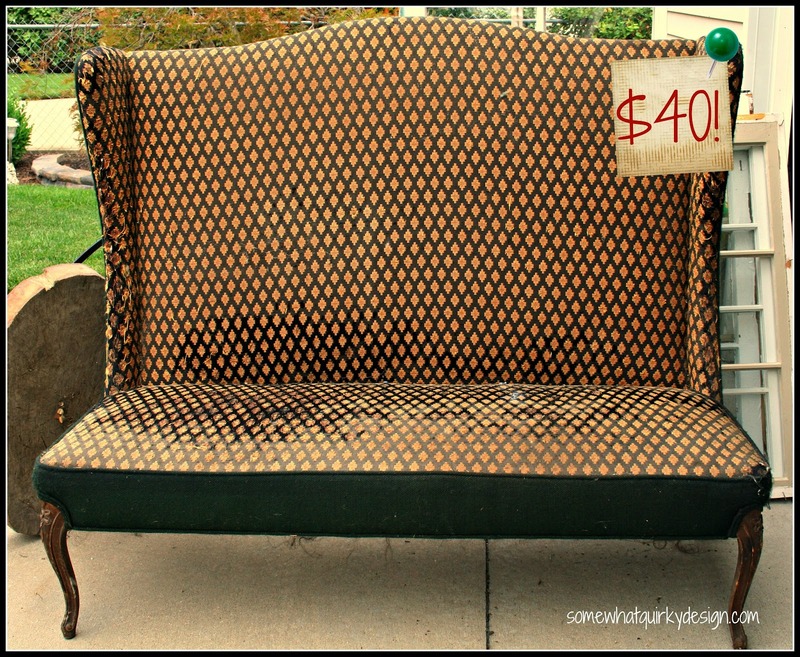 That settee, the chair...the freebies! Great day! Happy Birhtday, you certainly scored,love the antique oak and the candelabra will be great for Halloween if nothing else...great finds, my favorite...the settee!! The settee was a great find!!!! I also love the candelabra...It's stunning!!! I also love the chair and your free little dresser. Free...Isn't that a great word!! You did great on your day of the hunt! !